Police have described the latest arson attack in Larne as ‘madness’ and say that a ‘falling out between individuals’ may be at the core of the rash of burnings. Detectives are investigating an incident in Larne last night (Monday 17 April) in which a car was reversed into a building and set on fire. The incident at a hairdressers on Main Street was reported to police at around 9.20pm. The blaze extensively damaged the premises. It’s believed one male travelled to the scene in the vehicle, a grey Nissan Primera, and then fled on a blue and white motorcycle driven by a second individual. 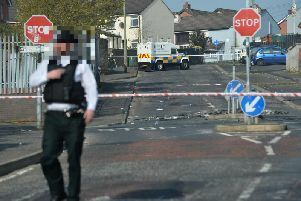 Detective Chief Inspector Dunny McCubbin said: “This was a mindless and reckless attack by individuals who have shown no concern for the people of Larne and no respect for the business people trying to make a living in the town. This business has been devastated by this attack and there can be no excuse or justification for what happened here last night. “We are currently investigating a possible link between this incident and other attacks on vehicles in the town over the course of the weekend. At this time it’s thought a falling out between two individuals may be the catalyst for these incidents however as the investigation is at a very early stage it wouldn’t be appropriate to comment further on that particular line of enquiry. “To date two men in their thrities have been arrested as part of our overall investigation. A 30 year old man was arrested on Saturday and subsequently charged with GBH and Possession of an offensive weapon. He is expected to appear in court in Ballymena on 11 May. The second male, 32, was detained yesterday. He has since been charged with Common Assault and Making threats to damage property. He is due to appear at Ballymena Magistrates on 4 May. All charges will be reviewed by the PPS.